After about a year of avoiding Bath & Body Works (my last visit was in April but it sure felt like a year since then) I finally caved and gave them another visit, around August. I’d tried (and failed) at finding a substitute for their Liquid Hand Soaps, but quickly realized that nothing else can come close to the real thing. As I mentioned earlier, I’m fully stocked up on B&BW Candles. 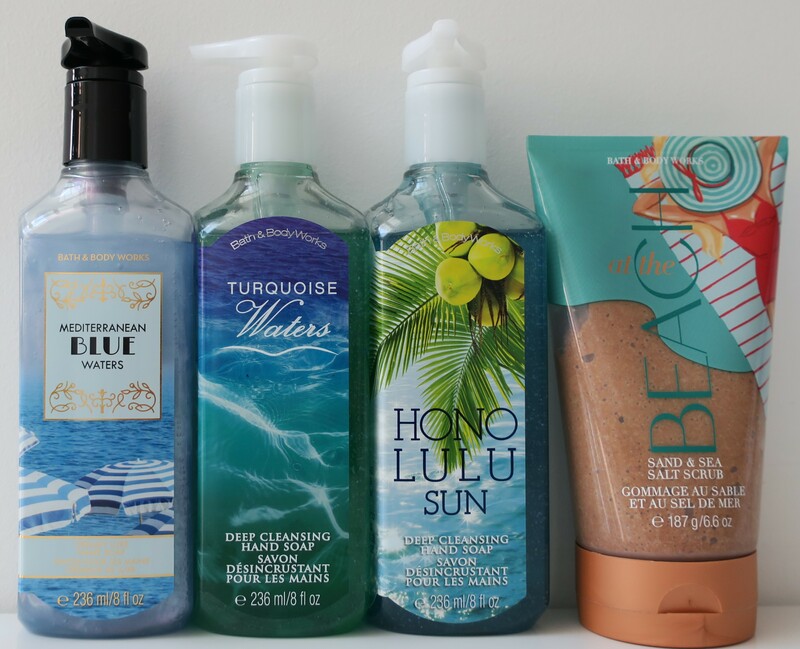 Also, I tend to use Shower Gel and Body Lotion from other brands (not just B&BW) so that’s non-issue for me. The Liquid Hand Soaps however, is the one area where I felt the loss, most keenly. I guess I’m just addicted to Bath & Body Works Deep Cleansing Hand Soaps. The issues I mentioned earlier still remain (non-exciting releases, never up to date, questionable scents, faulty packaging, products that may or may not have gone bad while sitting out on the shelf, ratchet displays and just being over-priced in general despite the fact that the quality seems to have gone down over time) but I’m willing to overlook all that, when it comes to the Bath & Body Works Liquid Hand Soaps. SoftSoap Whipped Cocoa Butter Foaming Hand Soap (hauled here) had a really nice scent… but that was pretty much it. The mechanics were definitely not the same. Unlike the B&BW Liquid Soaps that I was used to, I had to exert extra force with the SoftSoap Liquid Soap just to pump a little bit out. It wasn’t really a deal-breaker but it was annoying, especially when I was half-awake and planning to go back to bed right after (because the extra effort would sorta’ wake me up and consequentially stave off any sleep). What was a deal-breaker though, was the fact that SoftSoap left some sort of hydrating residue on my hands (pet peeve). I cannot stand any sort of residue on my skin. Bath & Body Works Soaps don’t do that. Once you rinse them off, they feel like they’re completely gone, and that’s just what I like. As such, I went to Bath & Body Works to pick up a few Liquid Soaps and managed to grab a Body Scrub while I was there. 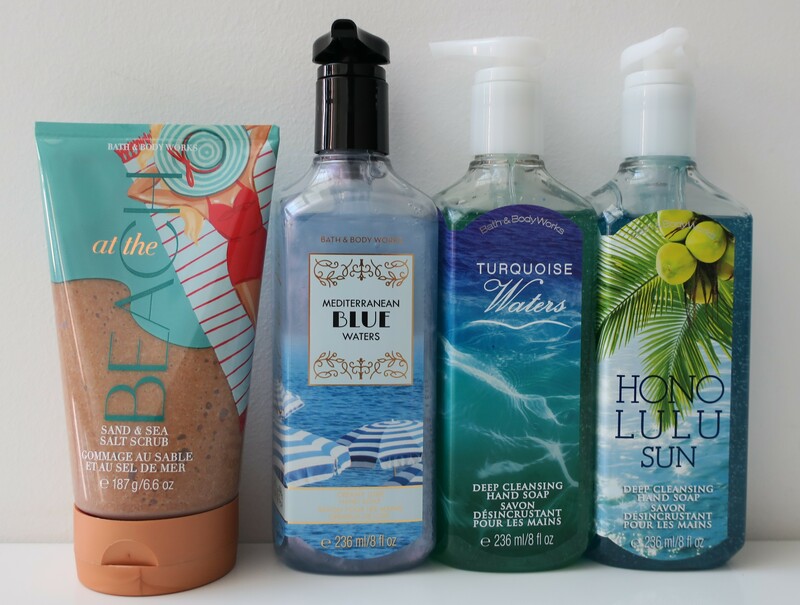 I haven’t been to Bath & Body Works in ages so I hadn’t really been keeping up with the newly released collections but I picked up Mediterranean Blue Waters, Turquoise Waters, and Honolulu Sun. Don’t they all look so pretty next to each other? For once, the “theme” wasn’t on purpose. My visit happened to be towards the end of the summer (hence the emphasis on all things aquatic) and I happen to adore uplifting, citrus-y scents! 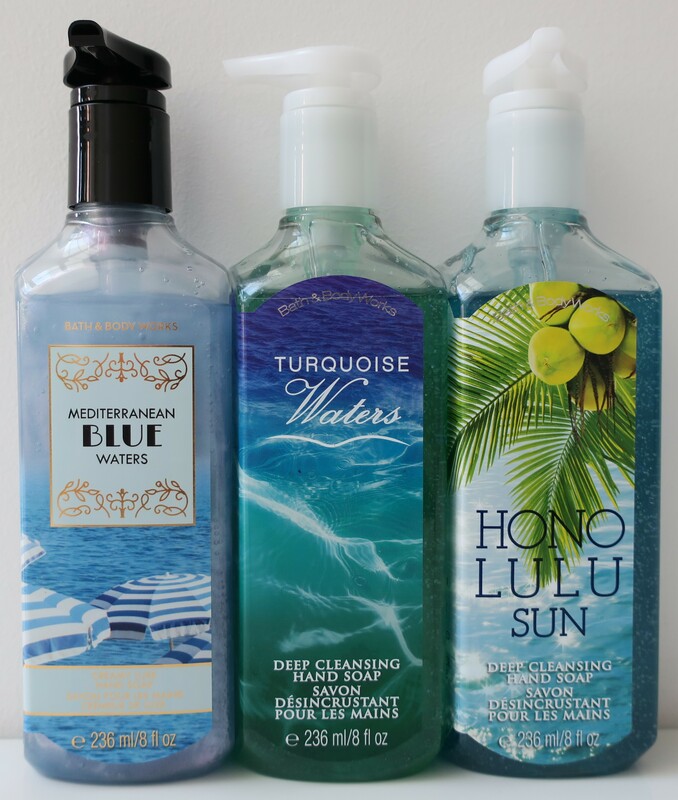 I distinctly remember purchasing Honolulu Sun (dark blue liquid) a while back (hauled here) so this was a repurchase. Turquoise Waters (green liquid) was available in candle form years ago, but I’m not sure if it was ever released in liquid soap form. Mediterranean Blue Waters (iridescent light blue liquid) was definitely new though because I’ve never seen the Creamy Luxe Hand Soaps at Bath & Body Works until now. I had to get Turquoise Waters because I was obsessed with the scent! Same with Mediterranean Blue because it both looked and smelled lovely! Since there was a Buy Two Get One Free deal, I chose Honolulu Sun because I wanted something coconut-y (despite not getting along with the earlier version, which I reviewed here). 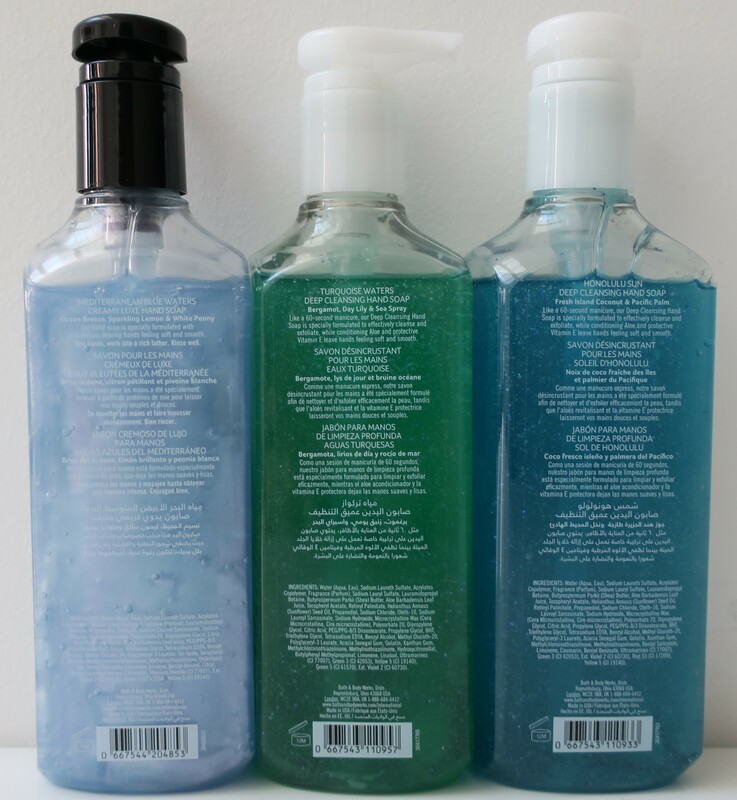 The Deep Cleansing Hand Soaps retail for KD 3/500 each (but I got 1 of the 3 for free). The Creamy Luxe Hand Soaps were available in several different fragrances, each with their own stunning packaging that housed even more beautiful iridescent liquid in it (that lilac-y shade was a true beauty!) but Mediterranean Blue Waters had the loveliest scent. I know I keep comparing every other scent to my Dolce & Gabbana Light Blue Perfume (reviewed here) but Mediterranean Blue Waters seriously reminds me of D&G Light Blue EDP lol It was all crisp and lemon-y (Sparkling Lemon) and aquatic (Ocean Breeze) with white florals (White Peony) and basically just perfection! Even the names seem suspiciously similar; Mediterranean Blue Waters and Light Blue. Despite the gold touches here and there, I also really love the packaging! Nothing says summer vacation (abroad) quite like stripe-y umbrellas! I’m a die hard fan of the Deep Cleansing Hand Soaps (with the exfoliating beads) but the iridescent liquid suckered me in and I just had to try at least one of the Creamy Luxe Hand Soaps. So pretty! As I mentioned earlier, Honolulu Sun was a repurchase. Thankfully, this version smelled much nicer. It was a nice, clean, soapy scent that was all sweet coconut-y goodness! I don’t even care what this smells like. I’m just obsessed with body scrubs in general. At The Beach had fun packaging while the blather on the packaging sounded intriguing (if a bit pretentious… I mean Polynesian Sand? C’mon now). Toasted Coconut seems like it would smell pretty good. Plus, I enjoy all things Sea Salt. This particular Scrub was KD 6/750 and the old me would’ve picked up 2 more items from that collection that were around the same price, just to take advantage of the Buy Two Get One Free deal but I’m trying to be good now (and wasn’t as interested in the other stuff lol). It’s been a while since I was last at Bath & Body Works (kinda’ missed it) so I’m actually glad that we’ve sorta’ rekindled our love-hate relationship! 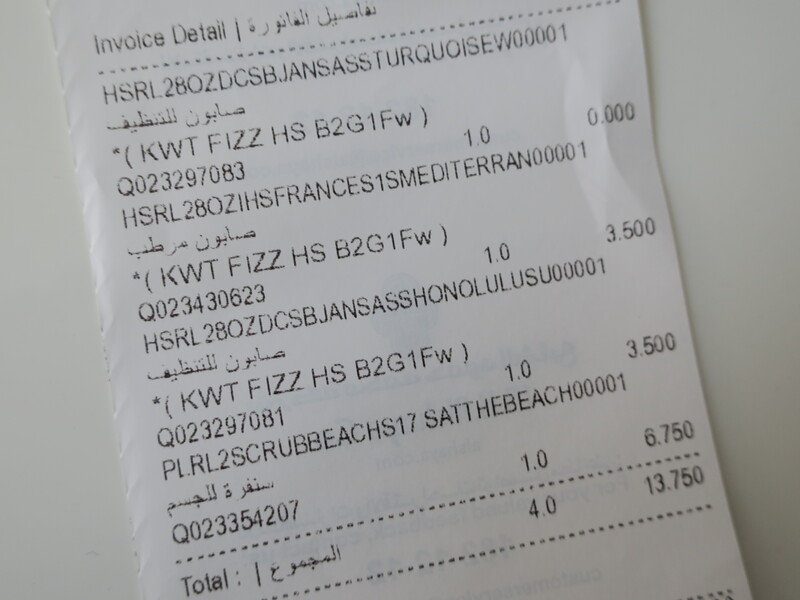 KD 13/750 for some soaps and a scrub might seem a bit steep but if I don’t visit them as often, it kinda’ balances out… yes? no? maybe?